Lando Calrissian Copies the Doctor’s Poor Fashion Sense! Ron Howard, who has taken over as director of the troubled untitled Han Solo… er, solo film, has already leaked more teaser material about the Star Wars standalone project than the previous directing duo, Chris Miller and Phil Lord, did during their tenure helming the project, which is great, but his latest teaser may not have the effect intended. Earlier today, the Oscar-winning director tweeted the above image from the film’s set. It was intended as a sneak peak at Lando Calrissian’s wardrobe, but the most prominent garment is absolutely unmistakable! Can I guess whose closet it is? Yup! It must belong to the Sixth Doctor! No one else in all of time and space could have a fashion sense that questionable! 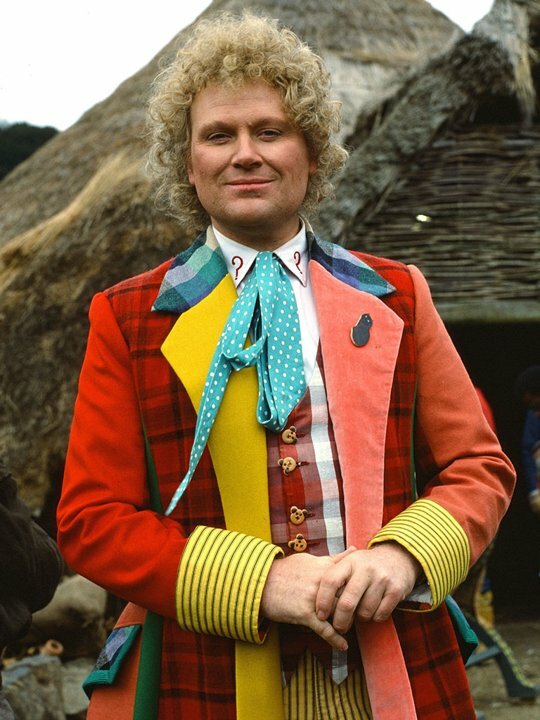 Colin Baker‘s sartorial assault on the senses was his Doctor’s trademark! Am I sensing an intergalactic copyright lawsuit against Lando actor Donald Glover? Rest assured, the Doctor has never relied upon frivolous lawsuits, and doubtless he isn’t about to start after some 2,000 years. But the costume similarity is clear, and now you won’t be able to unsee it! Clashing colors FTW! The Han Solo movie — assuming it gets finished and gets an official name — will be released May 25, 2018. The Sixth Doctor‘s crusade against couture is available on DVD and online services including iTunes, Amazon Video, Google Play and Vudu as part of the “Classic Series.” The modern, rebooted DW, which began in 2005, is only available on Amazon Prime. This entry was posted in Costumes, Cult TV, Film, Science Fiction and tagged Colin Baker, Doctor Who, Donald Glover, Han Solo, Ron Howard, Sixth Doctor, Star Wars, Untitled Han Solo Movie. Bookmark the permalink.